In our last blog post, we invited you to submit interesting targets to follow up with the Tillinghast 1.5m telescope at Mt. Hopkins this spring. Thank you to jessicamh, Gez Quiruga, arvintan, kmasterdo, silviug, wtaskew, cpitney, Pini2013, Ted91, Vinokurov, michiharu and everyone else who submitted targets! Thanks to your help, we picked out 102 objects to follow up this spring. The observing starts tomorrow night. And guess what? We’ve got more follow-up observing planned for the fall semester, and also for the Southern hemisphere, with help from our new collaborators, Luciano Garcia and Mercedes Gomez from Observatorio Astronómico de Córdoba and Christoph Baranec from the University of Hawaii. So we’re keeping that target submission form open. From now on, whenever you find an interesting target, anywhere in the sky, feel free to submit it. And now that we’ve been through this process, I can better explain how we decided what to follow up this time. This part of the blog post is going to be a bit technical–so feel free to skip it, or ask us for more info if you get tripped up by the jargon. Luminosity Class IV stars: A IV, F IV, G IV, K IV, M IV. These objects went onto a “Maybe” list, to be followed-up as second priorities. We could read some of this information from the SIMBAD spectral type. The quality of this information varies, and the SIMBAD spectral type includes a data quality letter (A,B,C,D, or E) where A is the best. Since the purpose of this observing run is to weed out blends and to get more accurate spectral types, we figured it was OK to look at objects where the spectral type quality was poor. But we threw out objects classified in SIMBAD or VizieR as M giants, Cepheids, Be stars, galaxies, Active Galactic Nuclei, eclipsing binaries, O stars or supergiants. The most common contaminants are M giants and supergiants. We want to avoid those. But some M stars are main sequence stars (dwarfs). Like this one: AWI00003dm Disks around these M dwarfs are rare and interesting and worth extra points! So we must be careful weeding out the M giants and supergiants. M giants are sneaky! They come with many different labels in SIMBAD and VizieR: Long Period Variables (LPVs), SR+L, Slow Irregular Variables, Miras, Semi-regular Variables, Semiregular pulsating Variables, Carbon stars. All those are kinds of M giants/supergiants and they tend to make their own dust, so we can’t use dust around them as an indicator of a planetary system. We’re not following them up. M dwarf disks are exciting but rare. Here’s a Hubble picture of one around a star called AU Microscopii. Sometimes you can spot an M giant even when there’s no known spectral type. For example, subtract the V magnitude from the K magnitude. If V – K > 3.29, you’re looking at an M star. Then, if a star has a measured distance of thousands of parsecs, you can bet it’s a giant or supergiant. So we declared some objects to be M giants based on color and distance. A real M dwarf is so faint we can only see it if is much closer than 100 parsecs. If you know you’re looking at an M star, another good clue that it’s a giant/supergiant is if it is highly variable (e.g. amplitude more than one magnitude). So we looked up the variability amplitude for our targets in VizieR as well. For an M star with no parallax measurement and no variability measurement, it can be hard to tell if you’re looking at a dwarf of giant or supergiant. So I put objects like that on the “maybe” list. Whew—that’s a lot of detail, I know. But now you can see why we try to weed out all those blends and multiples etc. using the handy animated flipbooks on the DiskDetective site before we start all the detailed research on each one. Here are all the objects on our current version of the follow-up list for the Tillinghast 1.5 m for this spring, below (this list includes the maybes). Thanks again for all your hard work. And keep our fingers crossed for good weather at Mt. Hopkins! You may recall that in February, we submitted our first follow-up observing proposal. We asked for two nights of time on the FAST spectrograph on the Tillinghast 1.5m telescope at the Fred Lawrence Whipple Observatory. Well, not only did the time allocation committee like our proposal. They gave us more time than we asked for! Depending on the weather, it looks like we will have about four nights to follow up our favorite good candidates. So now we need to make a new list of targets, and we need your help! 1) Good candidates in Disk Detective. 2) Mostly in the Northern hemisphere. So make sure the declination is > -20 degrees. 3) Up at night during the months of May-July. That means the Right Ascension of the object should be less than 25 degrees, or greater than 120 degrees. 4) Bright enough to see with this telescope. That means V magnitude < 15. You can find the V magnitude for some of the objects at SIMBAD through the Talk pages. For other objects, you have to look in VizieR. Remember, when you search VizieR, change the search radius to 0.2 arcminutes, to match the WISE beam at 22 microns. 5) And while you’re looking in SIMBAD and VizieR, jot down the spectral type, parallax, the J magnitude, the proper motion, etc. On this observing run, we will be collecting medium-resolution spectra of the targets, to check if they are indeed stars, and to get better measurements of their luminosity classes–whether they are on the main sequence or not. So if there is not much information in the literature about the spectral type, that’s OK. But some targets will be clearly identified as giants, or supergiants, or Cepheids, Miras, Be stars, RR Lyrae stars, or Long Period Variables. 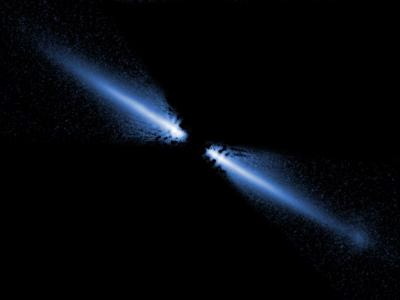 These kinds of stars all make their own dust, so finding a disk around them doesn’t indicate a planetary system. You can send those in if you want, but they won’t be our first priority this round. For now, we’re mainly interested in dwarfs and subgiants (luminosity classes IV and V) and even white dwarfs, if you can find them. Send in your new target suggestions–as many as you like–in by this Friday (April 11). And if you can’t find any in time this week, don’t worry! We’ll be applying for more observing time later on.